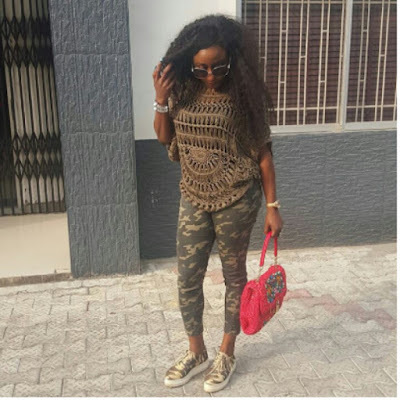 On a scale of 1_10 what will you rate this camo combo worn by INI Edo AKA, "daughter of the lion of the tribe of Judah?". On a side note, would you be brave/crazy enough to pull of a look like this on the streets of naija? God 4bid bad tin ! I don't even where to start rating her,just love the bag. Its nice and easy. A 9 or even 10 will do.